ELV-148. Cap sleeve ladies junior size tee. 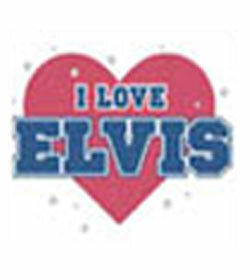 I Love Elvis - printed in blue over a red heart printed with glitter ink. Made from 100% cotton, ribbed knit. Junior size is worn by teenagers and petite adults. Measures approx 13" across the front if laid flat. Length is 22". I Love Elvis - Ladies glitter ink tshirt.